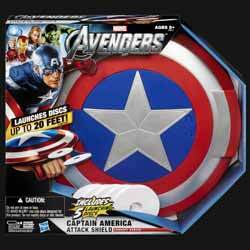 The Avengers: Captain America - Attack Shield is not an item I'd recommend for those looking for a cool display toy. This is designed for young fans of the character. And, with that in mind, this is a pretty cool release. It requires 4 x AA batteries (not included) to make the motorised disc launcher work. Once switched on the motor emits a buzzing sound (not unlike a mini hairdryer). 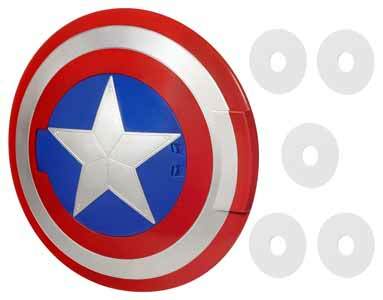 To get the discs to fire the front of the shield pops open and the foam discs can be placed inside. There's a release button on the handle of the shield which allows you to control when the discs are fired. It's well constructed and is great fun if you're into launching projectiles at things. But, as I mentioned previously, this is really only a toy for the very young, as collector's won't be impressed by how small it is. While the press information we received stated that the disc had a diameter of 15 inches, this isn't the case - it's more like 13.5 inches.